Hohum here was me hoping GWR and SWR would work to NR to fix the long waiting times at the North Camp - Ash Vale interchange. Currently in the evenings I have to wait 20-30 minutes for a train from Ash Vale on to Alton because their timetables don't match up. The May timetable was the perfect to start looking at fixing but there don't appear to be any changes to the timetables to try and start fixing this. No signs of any improvements on the the North Downs line at any point in the near future either. Bit of a Cinderella service to be honest. I am aware that GWR have been looking to increase their services on the North Downs line from 2 to 3 per hour, but I understand that there are issues with level crossing safety yet to be resolved (as I understand it, more trains = higher risk). And GWR trains are due to go up to 4 carriages, and be changed to a type that can run on electric power on the electric sections, at the end of the year. Not sure how the extra trains, and the potential changes in train performance with 'bi-modes', will effect timetables - I'll leave that for others to comment on. Connections aren't highest priority on train operator's lists, I'm afraid ... though a little local help to inform them of concerns / user groups / CRPs etc can be a big help. Remember that their eyes are very much on meeting their contract which rarely includes connection times ... and they have hundreds of stations to look after and can so easily overlook opportunities to improve services. That particular connection time is probably about as low down the operators' priority list as you can get. 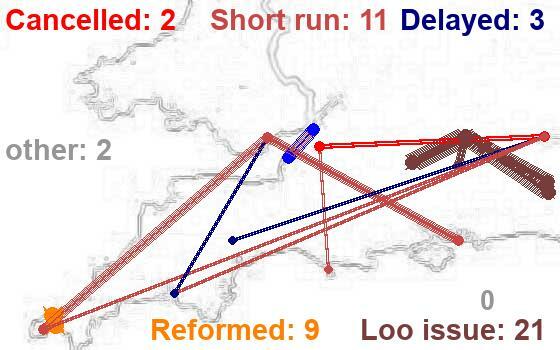 It's between operators, the SWR timetable is too complex to change for it; the North Downs is a long(ish) cross-country run, it meets several other lines, and it has its timing set by the busy stations it has to share (Gatwick/Redhill and Guildford). So even if there is a will (and there may not be) you will probably end up with what you end up with. I've had these "walking legs" crop up quite often when looking at journeys from Wokingham to the south or south-west, but hardly even actually done it - in part because the timing (walk plus wait) makes rail an unatractive mode. I'm not even sure about their status; while the NR Journey Planner does offer them, I can't see anything in the Routeing Guide that says they are even permitted routes. But, as a regular user, how many other people do you reckon use that interchange (or the Farnborough one)? That walk/delay does look unfavourable to say the least. The SWR peak time departures to Alton from Waterloo miss out a couple of stops like Brookwood which makes for an earlier arrival at Ash Vale, breaking your connection (off-peak it can probably be made off the Redhill train in the 'official' 11 minutes allowed if you walk briskly and easily off the Gatwick Airport one from North Camp). Another couple of thoughts - those heading the other way, from Guildford to Bentley and Alton will now generally have a bit longer to wait at Aldershot as a result of the May change. Presumably the class 769s will have to switch over from diesel to electric while stationary and not all trains stop at Ash. Potentially running on diesel all the way from Wokingham to Reigate for those faster services? I can't remember where I read it, but I think Ash Vale has missed out on the DfT disability funding pot or whatever it is called; so more trudging up the stairs (for those fortunate enough to be able to). And a welcome from me too - good to see another North Downs line passenger on the forum. Are we correct in assuming that you are coming from Guildford to North Camp? If so, perhaps you might want to "like" my suggestion on 5 April (see - http://www.firstgreatwestern.info/coffeeshop/index.php?topic=21342.0) that the new split Guildford to Farnham service be extended to Alton. This is not the only inconvenient change of train timing for the North Downs service, I'm afraid. Welcome. 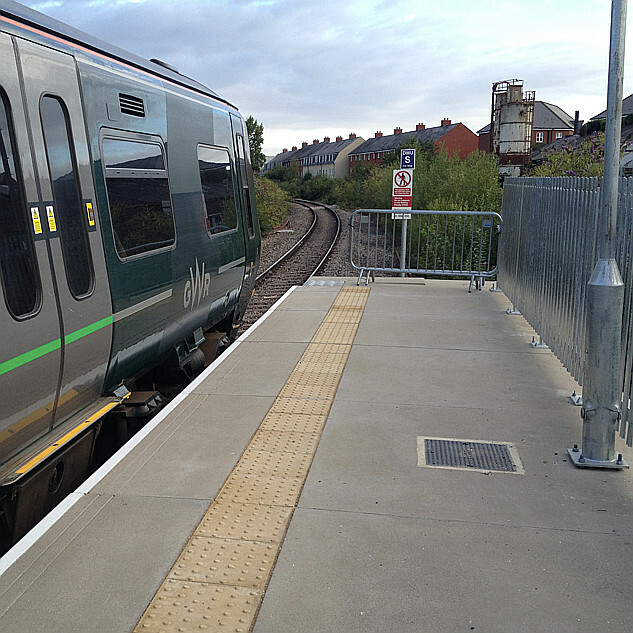 Ash Vale was not in the latest list of stations to get accessibility funding announced in the last week or so. It would be a major job. Any time I save cycling from North Camp I lose puffing up the stairs.